This dainty Yogo sapphire ring has diamond accents on both sides of the offset band. 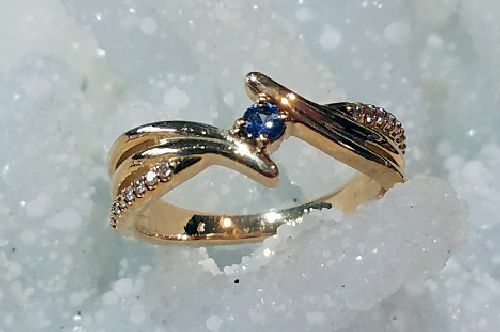 Set in 14k yellow gold, the 2.8mm Yogo sapphire sits perfectly nestled between the diamonds. Great Yogo blue color that really shows off nice in the yellow gold ring. This ring is size 6 3/4 but sizing is an option for an additional charge. This ring would make a very nice engagement ring, promise ring or just everyday wear. Sapphires are the birthstone for September as well as the 45th anniversary stone.